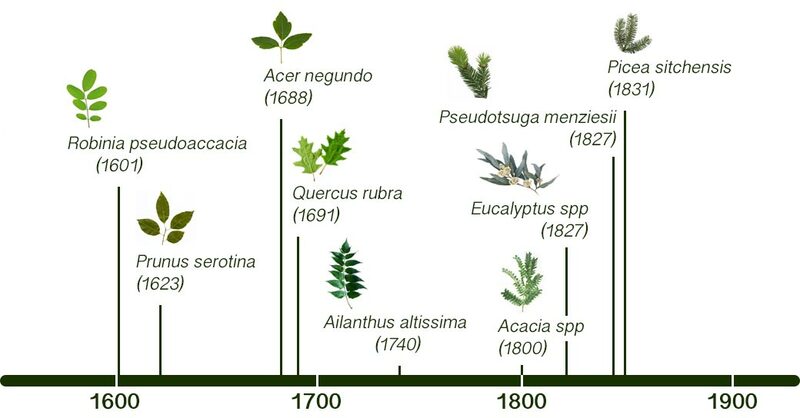 Researchers and practitioners were interviewed on the topic of introduced tree species to European forests. For individual interviews, please visit Media ->Interviews. Visit 'Events' for more information on conferences and policy events on the topic of introduced tree species. We organise workshops for school children in order to transfer information regarding introduced tree species. These workshops comprise of presentations and creative sessions for children. A book on the topic of 'Introduced tree species to European forests is being prepared as a part of the project In-Tree. It will be a compilation of chapters exploring various aspects of introduced tree species in the context of European forests. As a part of the project In-Tree we facilitate for expert exchanges among various parties; e.g. practitioners, academics, policy makers, etc. The aim of the expert exchanges is to showcase a variety of management scenarios supported by knowledge and experiences from other regions. For a comprehensive view on the topic of introduced tree species, the IN-TREE project issued a policy brief that was translated into 5 more languages beside English. 46 participants from 12 countries, forest associations, the European Commission and NGOs attended a policy event in the Permanent Representation of the Czech Republic in Brussels. They discussed the results of the “In-Tree project - Introduced tree species in European forests: opportunities and challenges”. IN-TREE book and policy brief published: Download here! The main project deliverable is now finalised and can be downloaded here. For the political event in Brussels an IN-TREE policy brief was prepared.